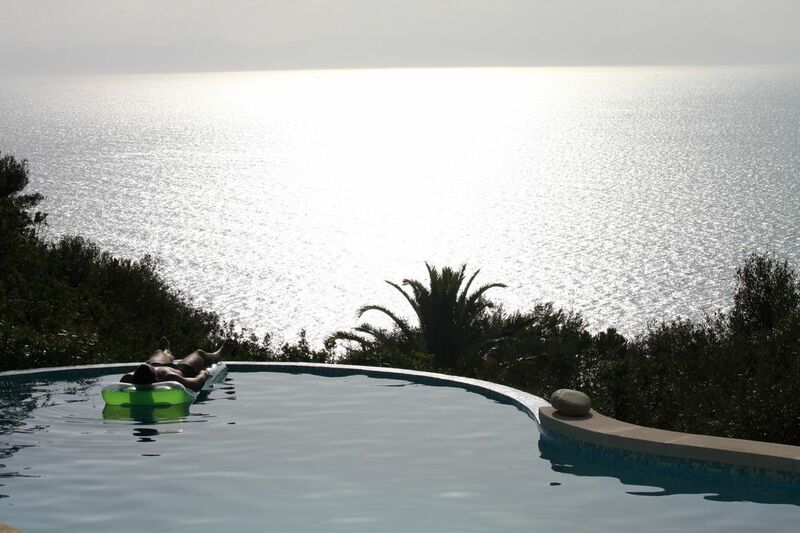 The villa has a beautiful private infinity pool by the sea, 4 double bedrooms, all with air conditioning and private bathroom, 2 kitchens, one indoor, the other pool view and 2 other shared bathrooms. It is equipped with TV, gas barbecue, fireplaces, ping pong table, WiFi internet and covered parking for cars. Well separated from the neighboring houses, surrounded by hedges and trees, the villa offers silence, privacy and all the comforts needed for a wonderful holiday. Perfect for both families and groups of friends, the property has at least a dozen nearby beaches. Each room is equipped with independent air conditioner. 8 pillows with pillowcases 8 sheets A weekly change is included if you stay for more weeks. There is a weight bench with dumbbells. Possible excursions by boat or boat rental. The pictures don't do this place justice, Sardinia is full of incredible views but the view from this place tops them, and the best thing is that it's exclusively yours. The house is extremely well equipped with everything you need, even the facilities for the pool, BBQs really make it feel like a home away from home. Valerio is the best host I've had the pleasure of meeting. Very warm, welcoming, answers any queries you have quickly and was kind enough to drive us to the shops when we arrived to pick up any necessities. Don't hesitate in booking, this place made the holiday one to remember. Fabulous property with stunning views. Evenings spent on the terrace overlooking the bay. Superb beaches everywhere. Very enjoyable and relaxing holiday. Had a fantastic week at this villa. House itself, garden, outdoor facilities and pool were all top notch. A highly recommendable place to stay and a very nice and helpful owner (Valerio). If we ever go back to Torre delle Stelle, we know where to stay. Surrounded by greenery, (providing perfect privacy), the villa is tastefully furnished and decorated and well cared for. Comfortable beds, efficient showers & air-conditioning, well-equipped kitchen, not very spacious, but then there's another one by the pool if you're cooking a banquet, and a big gas barbecue. Gorgeous pool with numerous sun beds and deckchairs and a covered games area with a brand new table tennis table (we made good use of that). Several communal areas easily accommodating 6-8 people but also secluded little niches if you want more privacy. Perfect! Get your provisions in - nearby there's a perfectly adequate grocery store, obviously slightly pricier than the big supermarkets - rest and relax in good company and there's no need to leave. Alternatively explore the neighbouring sandy beaches (there are many) and little villages, check out Cagliari's museums and sights, take a boat trip, go to Nora for archaeology and admire the nuraghic construction techniques - all easily accessible from the villa. We (5 adults aged between 47 and 73) did a bit of both and had a fantastic holiday. We thoroughly recommend the villa for its location, the accommodation it provides, for the scenery and the tranquillity. Before your holiday do make use of the App provided for all practical information (unfortunately we did that a bit too late) and do not hesitate to get in touch with Valerio who's a charming, very helpful and understanding host. A SatNav is a must when negotiating the winding roads of Torre delle Stelle. The villa is lovely and the ever-changing view fantastic. Our family of 6 rented for a week and enjoyed every minute- even watching the rain over the ocean for a brief time one day. The rooms are well appointed and the mattresses comfortable. Valerio could not have been more accommodating. Although tucked away in a private setting, there were numerous fun restaurants within a 15-minute drive. Don't miss the Wednesday family night dinner at Ristorante Genn'e Mari for the ultimate Italian immersion dinner. There are numerous lovely beaches in the area- some with amenities, some without, and it is close enough to Cagliari for a day trip or two. The kitchen is small and not really suited for cooking big meals, but the fresh pasta, some salad, meats, cheeses and bread from the GSA market next to the restaurant (see above) will be easy to do, along with breakfasts and simple lunches. The oven in one level below in the poolside kitchen. Another comfy chair or two in the living space would be nice. We brought in patio chairs. Our family group plays cards, drinks wine and chats until the late hours and made great use of the spacious lounge. The owners met us when we arrived. Their son Valerio was very helpful and all made us feel welcome. Valerio cheerfully answered phone calls and emails promptly, arranged for a cab to the airport for part of the group who had to leave early and arrived at 6:30 am with a smile on his face see us off the morning we left. Warning: roads in that part of Sardinia are often narrow, steep, winding, dirt washboards, but this is probably what has allowed it to remain quiet and secluded. The road surfaces in the village and leading to the villa are a little rough and could do with a resurface , but that was the same for many of the roads we travelled on in South Sardinia. I'm really honored for this review, If you return in South Sardinia give me a call! Best Regards from me and the electricians! Between Cagliari and Villasimius, and about 35 km from Cagliari, the village of Torre delle Stelle it enters the dense Mediterranean vegetation. 2 inland beaches, the resort is one of Italy's most famous holiday and known throughout the province of Cagliari. E' possibile concordare pulizie intermedie. Nella località si effettua la raccolta differenziata. Verrà applicata una penale di € 10,00 x kg di rifiuto non differenziato (cifra non rimborsata dalla caparra).